Leading Manufacturer of block printed woman garments, block printed garments, ladies block printed western wear, girls designer top, stylish women tunic and ladies designer top from Jaipur. 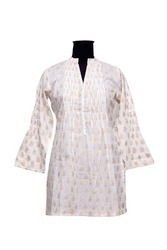 Our thorough search of the modern-day market allows us to offer a wide collection of Block Printed Woman Garments. The garment provided by us is carefully designed by making use of premium quality fabric with the aid of the latest techniques. Our offered Garment is checked by quality experts so as to ensure its flawlessness. This garment is obtainable in plenty of colors, shades & prints as per the variegated choices of the customers. Backed by the sound experience of the industry, we have been able to offer a stunning collection of Block Printed Garments. Offered printed garment is designed with quality proven material & advance techniques, in accordance with the modern fashion trends. 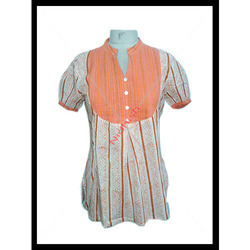 This printed garment is available in customized options as per the demand of customers. Our provided printed garment is rigorously checked by our quality experts in order to dispatch a flawless range. We are one of the prominent manufacturers, exporters and suppliers of a designer collection of Ladies Block Printed Western Wear. Exclusively designed and developed from finest quality fabrics, these kaftans are extensively acclaimed for a soft texture, appealing look, perfect fitting, unique color combination and attractiveness. Uniquely designed from optimum quality fabrics, these Kaftans are available in various mesmerizing designs and alluring patterns. In order to provide maximum satisfaction to our clients, we engage in the utilization of high-grade fabrics and modern machines, under the supervision of skilled professionals, in compliance with the industry guidelines, for manufacturing this range of Girls Designer Top. This ensures the product’s finishing, colorfastness, resistance to shrinkage and fitting. 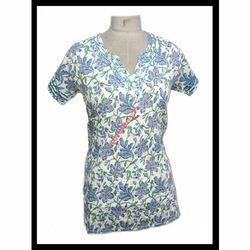 Being one of the leading makers and providers of this impeccable and attractive range of Stylish Women Tunic. we engage in the utilization of high grade fabrics and modern machines. This ensures the product’s finishing, fitting, elegance, colorfastness and resistance to shrinkage. Further, the range is marked at the most reasonable rate possible. 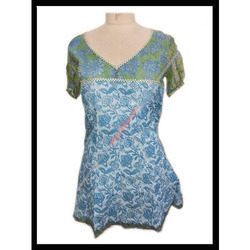 We export a wide range of Ladies Designer Top, designed exquisitely to enhance the persona and grace of a woman. The range includes tops, trousers, skirts, dresses and other garments for ladies. These garments are manufactured from the high grade fabrics that ensure the durability and long life of the products. We use reliable and trustworthy vendors to avail us the best quality garments in diverse colors, sizes, designs and pattern. The garments we export look elegant and alluring on the women. These are perfect to beautify the personality of a woman and present her in an attractive form. Our company is offering a premium quality range of Designer Western Dresses to our highly valued consumers. These are designed and fabricated with top quality fabrics and varied other fashionable fabrics. These are designed and fabricated with top quality fabrics and varied other fashionable fabrics by our vendors. This range is highly treasured for unique styles, attractive patterns and vivid colors. 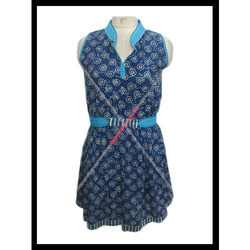 We are well recognized for presenting a smartly fabricated variety of Hand Block Girls Tunic Top. Our industry personnel design these dresses using premium-grade fabric and cutting edge technology with extreme care. These dresses are accessible in different colors, sizes, designs and patterns as per the requirements of our patrons. Furthermore, these dresses are acclaimed for their supreme quality and attractive designs. 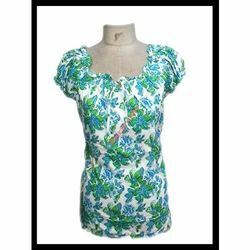 We are one of the prominent manufacturers, exporters and suppliers of a designer collection of Ladies Cotton Printed Top. Exclusively designed and developed from finest quality fabrics, these kaftans are extensively acclaimed for a soft texture, appealing look, perfect fitting, unique color combination and attractiveness. Uniquely designed from optimum quality fabrics, these Kaftans are available in various mesmerizing designs and alluring patterns. the provided printed blouse is available at affordable prices for our clients. Keeping in sync with the time, we are offering a beautiful collection of Block Printed Drawstring Ladies Pants that are perfect to carry in parties, functions and other occasions. The ladies pant provided by us is designed using high grade cotton fabric that is procured from the certified vendor of the market. Our offered ladies pant is checked by quality experts so as to ensure its flawlessness. 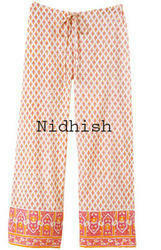 This ladies pant is good demand in the market due to high quality and durability. We offer an exquisite range of Western Dresses in different hues and exciting prints. These arewidely appreciated for its superior designs and best fittings. These are comfortable to wear on all occasions. Owing to years of industrial experience and sound knowledge, we have been able to provide a wide range of Handblock Printed Drawstring Pants. Our drawstring pant is designed keeping in mind the sensitivity and softness of skin. Our offered drawstring pant is comes in numerous sizes & customized options as per the requirements of customers. In addition, the provided drawstring pant is available at affordable prices for our clients. We are engaged in offering wide range of Fabrics and Garments. We use quality fabrics for designing our range of garments. These are available in attractive designs and vibrant colours that suit the diversified preferences and tastes of our customers. Moreover, we can also customize these garments based on our customer requirements. 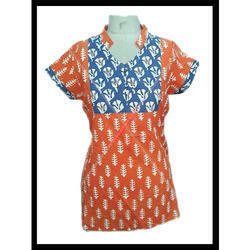 Looking for Block Printed Ladies Western Wear ?